Long Beach, USA. 1° aprile 2016. California ospita la Formula E: il Sabato (2 aprile, gara alle 16:00 ora locale, 1:00 CEST nelle prime ore di Domenica mattina) la serie di corse elettrica corre a Long Beach alle porte di Hollywood. 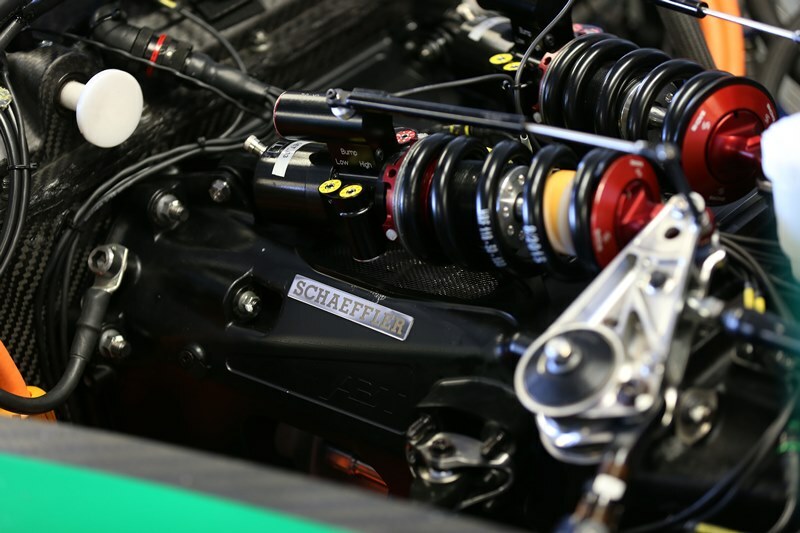 Prima ancora che le vetture fossero scoperte dagli involucri del trasporto, c’era già molta attività nel team, c’era molta azione nella squadra ed attorno l’ABT Schaeffler Audi Sport Team. Daniel Abt ha trovato una grande forma per i giorni di gara a Long Beach dopo fare un giro in barca. Insieme con il collega pilota Jerome D’Ambrosio, il tedesco è andato alla ricerca di balene – purtroppo senza successo. A parte due piccole creature e diverse altre specie che sono state avvistate. Mentre la squadra è pronta a Long Beach per l’ePrix di sabato, la prossima generazione di auto elettriche viene portata a termine con successo in una tappa importante sulla strada verso il futuro: l’ABT Schaeffler FE02, come verrà denominata la macchina nella terza stagione, ha superato il crash test obbligatorio sotto la supervisione della FIA. Il passo successivo: test approfonditi su un banco e l’omologazione ufficiale alla fine di maggio. Il ritrovo del Giovedi sera a Long Beach è stato il bar-BO beau situato a poche centinaia di metri dal circuito. Il partner Warsteiner ha invitato ogni membro della famiglia della Formula E per arrivare in vena di gara, godendo di una birra fresca. Oltre a Daniel Abt e Lucas di Grassi, che è salito sul palco per una breve intervista, innumerevoli rappresentanti dei media, sponsor, membri del team e piloti si sono incontrati durante l’ormai tradizionale Giovedi Warsteiner elettrico. Al fine di ottenere l’ambito FanBoost, che dà a tre piloti una porzione extra di energia durante la gara, Daniel Abt ha provveduto a degli accorgimenti insoliti. Prima della gara, il tedesco ha annunciato via Twitter che avrebbe “camminato nudo per la griglia cantando canzoni di Taylor Swift” se ottenesse il voto “Quello che era iniziato come uno scherzo si è sviluppato rapidamente quando il meccanismo si è messo in moto. L’annuncio di Abt è diventato il più Tweet di maggior successo, lo catapultò nel gruppo di testa nella classifica FanBoost e ha anche fatto notizia sul canale televisivo statunitense Fox. Long Beach, USA. 1° April 2016. California plays host to Formula E: on Saturday (April 2, race at 16:00 local time, 1:00 CEST in the early hours on Sunday morning) the electric racing series starts in Long Beach on Hollywood’s doorstep. Even before the cars broke cover on track, there was plenty turned a wheel in anger, there was plenty of action in and around the ABT Schaeffler Audi Sport team. Daniel Abt got in the mood for the race days in Long Beach by taking a boat tour. Together with fellow driver Jérôme D’Ambrosio, the German went in search of whales – unfortunately without success. Apart from two small specimens and several seals, no creatures were sighted. Daniel Abt compiled his experiences in a Vlog: http://bit.ly/1MEieT7. 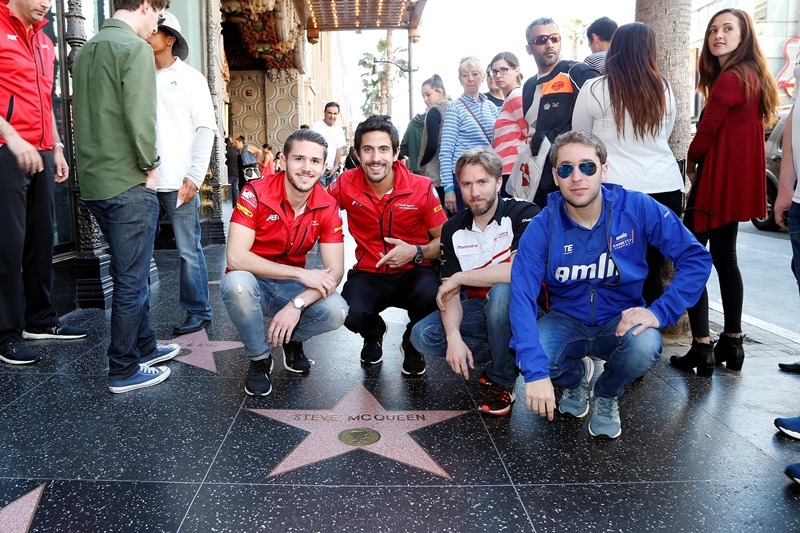 Also on view here: how the youngster didn’t find the famous Hollywood symbol while out jogging with his team mate Lucas di Grassi. While the team prepared in Long Beach for Saturday’s ePrix, the next generation of electric car successfully completed an important milestone on the road into the future: the ABT Schaeffler FE02, as the car will be called in the third season, passed the obligatory crash test supervised by the FIA. Next step: exhaustive tests on dynamometer and the official homologation at the end of May. Favorite haunt on Thursday evening in Long Beach was the Bar BO-beau located just a few hundred meters from the circuit. Partner Warsteiner invited every member of the Formula E family to get in the mood for race while enjoying a cool beer. In addition to Daniel Abt and Lucas di Grassi, who climbed on stage for a short interview, innumerable media representatives, sponsors, team members and racing drivers met during the now traditional Warsteiner Electric Thursday. In order to claim the coveted FanBoost, which gives three drivers an extra portion of energy during the race, Daniel Abt took unusual steps. Before the race, the German announced via Twitter that he would “walk naked to the grid and sing songs by Taylor Swift” if he got the vote.” What started as a joke quickly developed its own momentum: the announcement advanced to become the most successful Tweet on Abt’s account, catapulted him into the leading group in the FanBoost classification and even made the news on US television channel Fox. Votes can be cast until shortly after the race starts.